2.75" thick x 5", four laminations of red oak, six floating 4" tenons in corner joints. Sliding doors: 4.25' x 13'. Glass weight=310 lbs, Total door weight = 440 lbs. Passage doors: 2.6' x 12'. Glass weight = 200 lbs. Total door weight = 310 lbs. Here is my opinions I hope they are helpful. Red oak primary use is for indoor furniture and rates fair for stability, poor for rot resistance. For the sliding door I would use at least a 6" wide stile plus profile. For a door that size, I would go to 3" thick stave core stiles ( pine core, rift sawn white oak faces). I am not much help either. The sliding door has support along its width, so is not as critical as a swinging door. I do not like loose tenons since it is one more part to make, one more joint with a potential failure. That may be more personal prejudice than reality. The old rule on tenons is they should be 1/3 the thickness of the rail/stile. 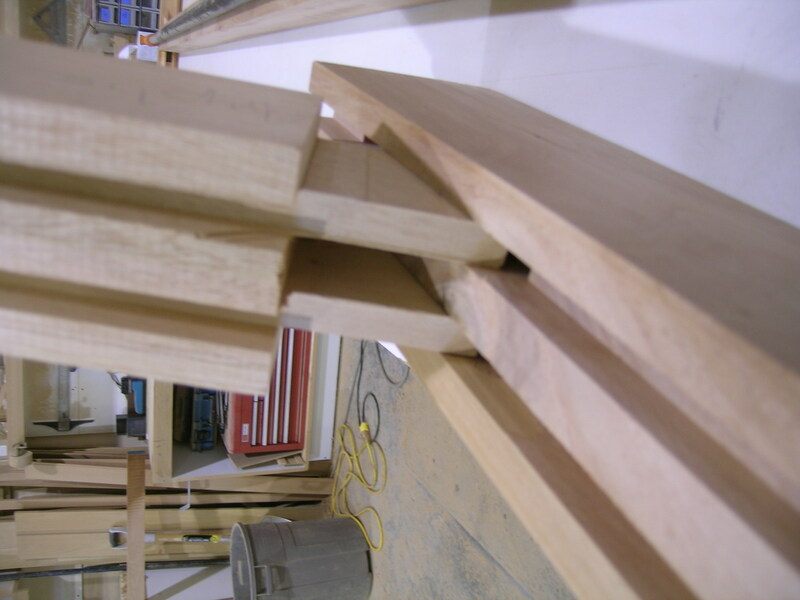 Once we get to 3" door thickness, we like to double the tenons up, as in the photo. You can also factor in cope and stick profiles if the design allows. They will add to the joint strength. 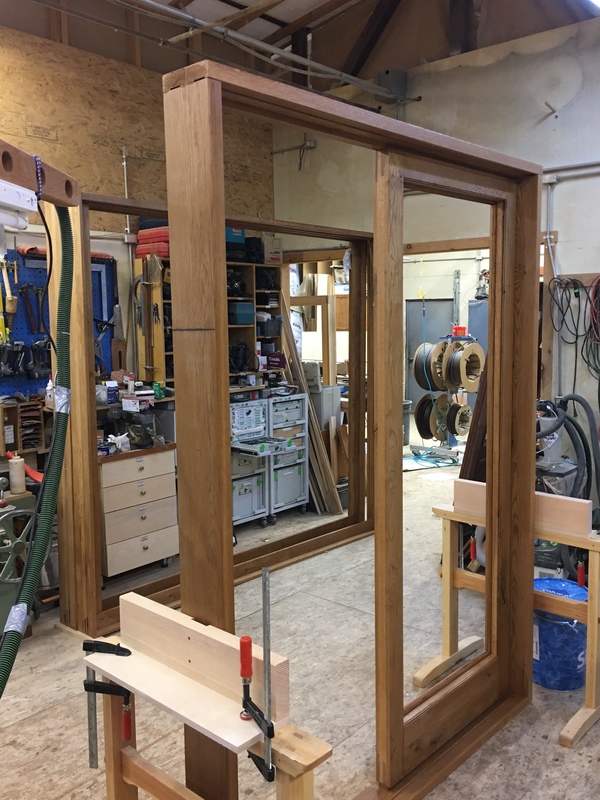 The glass, when set with an RTV silicone as we do here (both sides of the glass get it), becomes one with the wood and really adds to the strength of the door. I know the engineers will not allow that, but it is a fact. Glass people say the glass needs to 'float'. You may know more about this than I since we mostly deal with divided lights, not wall size glass as you propose. Geoff, I strongly disagree with you in regards to red oak not Having good rot resistance. I live in northern Michigan. Many people seek out dead standing oak for fire wood as it doesn’t rot quickly. Many turn of the century(two turns ago) homes have doors and thresholds that have lasted quit well. It is high in tannins, and that helps it to last. What experiences do you have to say that it is poor for rot resistance? I use it for the cores of my engineered doors most of the time. This is in Hoadley's Understanding Wood as well. It is common knowledge in New England. 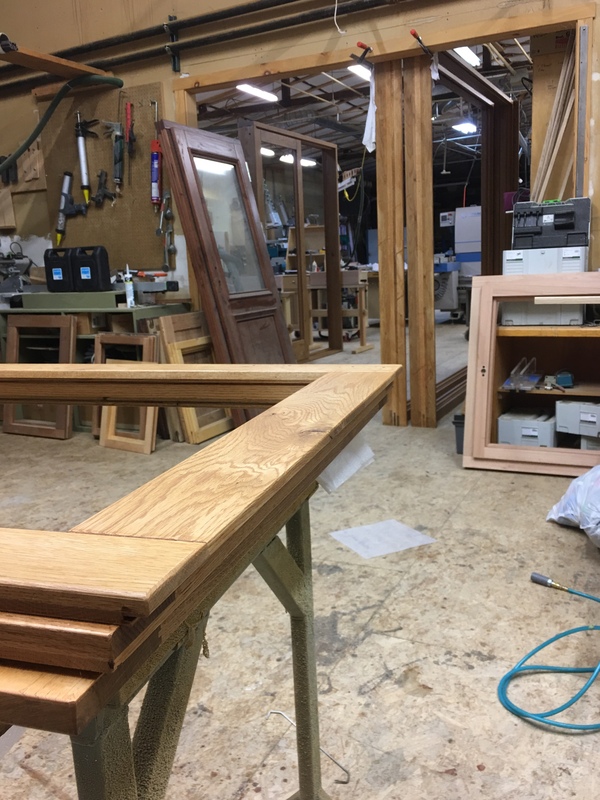 We use white oak, which is a closed end grain, for door thresholds and boat building. We use red oak for interior applications only. There is another problem with red oak for an exterior door. The sun will turn it pale yellow. Comments on the Red Oak duly noted. We'd thought treating the ends with a sealer, but I was not aware of the color change with UV. The reason Red Oak is being considered is because we can get it here in 16' lengths for continuous laminations. While Spanish Cedar would be preferred, it is only available in 10' lengths, and we don't want the visual of a finger joint. Of course, the other deterrent to the oak is its weight. When you say "euro" do you mean that your exterior sliders will use a "lift and slide" mechanism? If so you could use much narrower stiles and bottom rails. The limit on the stiles is governed by the back set on your hardware. I recently made one at 80mm which was the absolute narrowest I could get with the hardware. Joe Calhoon recommends doweling the joints because it is vital that the door is square. It will move around on you and he uses the glass to hold it square. OTOH, I use slip tenons, but make sure it's square as we set the glass. Comparing standing, dead, red oak (or any species for that mater) being good for firewood (or even saw logs) is much different than using it in a sawn and weathered condition especially a door or window. We will often leave a sound tree that is dead/standing til we can get to it (within reason) because standing dead trees without massive damage are still protected by default. I have a small commercial shop here (in comparison to most) and also have a large timber stand (150 acres) with a sawmill. Many many species will weather "well" while standing provided they are not rotten down the center allowing mother nature to treat them like a giant five gallon bucket. Red oak for us weathers the absolute worst when not protected from the elements in all ways possible. As stated, you need only to look to google to see people blowing bubbles through fairly long pieces of KD red oak because the capillaries remain open like thousands of straws (or maybe wicks would be more scary) in your work. There are several videos of submerging pieces of RO and WO in water or solvent and watching how fast and far the capillary action works. Its far and fast in RO. Sealing the end grain is a very shallow and temporary fix but I guess a lot would be dependent on the level of exposure. First, all Old Growth wood - very high ring density - will weather measurably better than current commercial species. Poplar was a key wood for log cabins around here 200 years ago, and some are still in fine shape. Yet the current stuff is grown like corn, and rots as fast. Secondly, a good epoxy coating on any/all end grain will prevent not only smoke and bubbles, but also the microbes from moving in. 2-3 coats may be needed, let it soak in. Third, there is exposure, and then there is exposure. North facing, with a broad overhang is ideal around here. I have seen our doors 15 years later in such a location and they look nearly perfect. South facing, no overhangs, seaside, windblown, equatorial - replace every year or two. Fourth, I do not have direct experience of the real differences in White Oak vs Red Oak. No tests or even decent observations. I just repeat what I have learned from others and various books/charts/graphs, etc. Including Hoadley. Since I desire to get all variables working in my favor, I will choose White Oak for exterior work when I can, unless new data can prove there is no need for that concern. Fifth (finally), What are the real threats for the OP's work? The glass will carry itself somewhat as long as it is sealed to the wood frame. The large sliders are held in a plane and not going anywhere but a few feet horizontally. The Oak is not going to rot this week or month or year. Warp? That is a condition of change in moisture content from the environment. It should not be a threat. Why would it? As in, what conditions can those doors experience that will cause warp? I assume he will warrant the work as he feels is appropriate. The conditions of warranty will be different whether he is the woodworker only, or finisher also, and installer. Doing the finish allows the doors the best chance for longevity. As Read mentions lift and slide stile and rail dimensions can go pretty small to push the glass opening larger. Glass on these just needs to be blocked above the carriages and can be blocked all the way around to square the frame if needed. Minimum stile width on these is hardware driven. For your large swing doors glass blocking is critical. The IGU should be cross blocked to throw the weight of the glass to the hinge stile. 13’ is tall but I think the stiles could be 110 to 120mm minimum at 68 mm thickness. A three or four stack rail on the bottom would help. At 13’ tall I would be thinking about letting a steel angle into the stiles to help keep straight. White oak is a better choice than red but depending on exposure you might be OK. Starting out 40 years ago we did a lot of Victorian style doors out of red oak and most are still holding up. Here are some pictures of 8’ tall lift and slide and fold slide swing doors going through out shop now. Stiles and rails are all 110/68 with double stack on bottom. Corners are slot and tenon but I would be comfortable with double dowels or loose tenons as well. Material is rustic white oak. This material is only available in 4/4 so our lamination is 19 face - 30 core - 19 face. The core we made butcher block by ripping and turning flatsawn stock to make rift and quartered. The 8’ stiles all came out very straight. Thanks everyone for the comments. I was hoping Joe would chime in. Yes, the lift & slide really isn't a concern. I like the idea of how the 30 core was handled, and the stacked rails at the bottom are also a plus. All good to go. Thanks. Is this a standard use of insulated glass? I haven't seen Insulated Glass Units that big in a custom operable door. I also don't get out much, and I especially don't get invited to parties at houses with 13' tall doors. Anyway, the shear load on the insulated glass sealant will be high if the pieces of glass aren't supported equally across the seal and along the length. If the stiles or rails move at, the shift will be exaggerated further from the pivot point. Having some flex to accommodate wood movement will depend on the elasticity of the sealants. Keeping the wood elements weaker than the sealant-glass bond allows sealants to win this tug of war. I am not an engineer, but having built thousands of insulated glass windows that failed, I consider myself an expert on what to watch out for. I'm curious Joe; we've have always placed spacers on large units to kick the glass toward the hinge. But too, we've always also used double-faced glazing tape, thinking the latter does not defeat the use of the spacers. Comment? The sealant is just a bead in the 3mm square rebate. I can order IGU from my supplier up to 7' wide by 10' or 12' long don't remember exactly the length. I try to avoid the large sizes as we don't have a vacuum lift in our shop. Sometimes we have large units delivered to the job site and install in place. 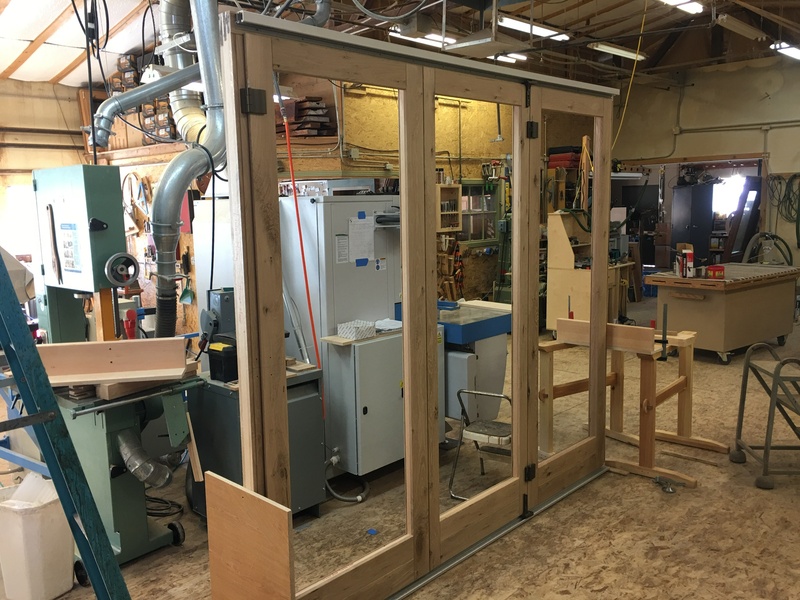 I was in East Coast custom window shop a while back and they built a lift and slide door that had a 20' plus piece of IG. Very costly to have a unit that size made. Another shop back there sources large units like that from Europe. I do not like the idea of holding glass with silicon either. The biggest cause of IG failure is one piece of the glass slipping and breaking the seal. Important to block under both pieces. If you set it in silicon it is a bear to remove if you have to replace. Our tooling is built with the caulk notch in the sticking for a bead of silicon. easy to cut with a razor for replacement. 15 years or so that I know of. I am real happy with the glass we are hitting with this current job. It is warm edge and made with some robotic machinery and the seals very neat. IG technology in Europe is advanced from what we se here. Shops there are now expecting to get 30 to 50 years from their units. I am curious about that also. We use glazing tape sometimes to adjust for thickness and sometimes to increase the depth of the caulk notch. It sticks pretty well but we alyways block under. This last job had some large tilt and turn pairs and the cross block seemed to work on those even with the tape. One of my counterparts in Europe says they leave the cover on the tape towards the glass so it does not stick. The only tape I can find here has blue covers and that will not fly.